Estranged fathers with expensive homes should be forced to pay more towards the upbringing of their children, one of Britain's most senior family judges has said. Full story: The Telegraph. See Green v Adams, below. Sir James Munby, head of high court’s family division, says he is ‘ashamed and embarrassed’ that no hospital place has been found for 17-year-old. Full story: The Guardian. See X (A Child) (No 3), below. The Department for Work and Pensions has updated its guidance which sets out how it will decide if a victim of domestic violence or abuse is exempt from the Child Maintenance Service application fee. Full story: Family Law. Parents' right to campaign outweighs risk to children, court finds. Full story: Community Care. See Southend Borough Council v CO & Anor. Legal stationers are stocking up on new family law forms which will need to be used by the end of the summer. 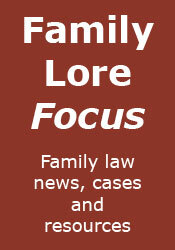 Full story: Family Law. Applications arising from order requiring the father to pay a lump sum to the mother, under Schedule 1 CA 1989. Full report: Bailii. Appeal by father against order allowing mother to take children to Iraq for four weeks. Appeal allowed. Full report: Bailii.